The Market Surfer Demo is a tool for manual traders who want to trade fast markets efficiently. 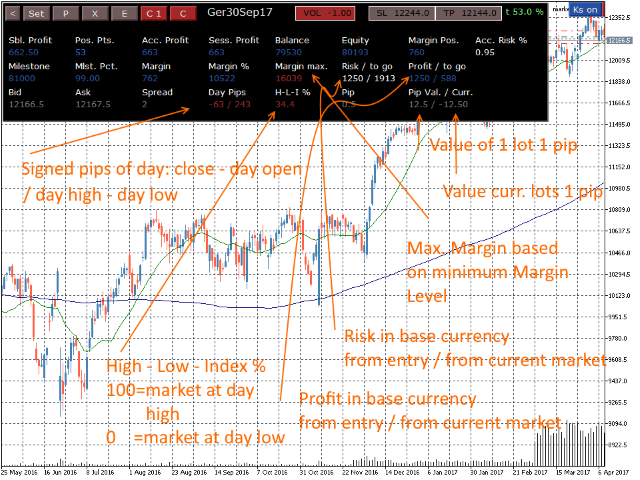 All trading actions, like Buy, Sell, Buy/Sell Limit/Stop, Close, switch, double, half, etc. can be done with just one click. Open, close, switch, switch half, switch double, double, half, etc. position with only 1 click. Quick selection of lot size, maximum deviation, stop and target pips. Convenient overview of most account, position and risk data. Risk and Target from entry and current market in money and more. Custom maximum margin to prevent you from taking too high risk. Fast order- and position control. Easy change of values for all quick selection parameter buttons. All settings saved and restored per symbol. Define close of a position by profit conditions, time or dynamic by Moving Average penetration. Have an overview over pending orders, change their levels with convenient buttons. 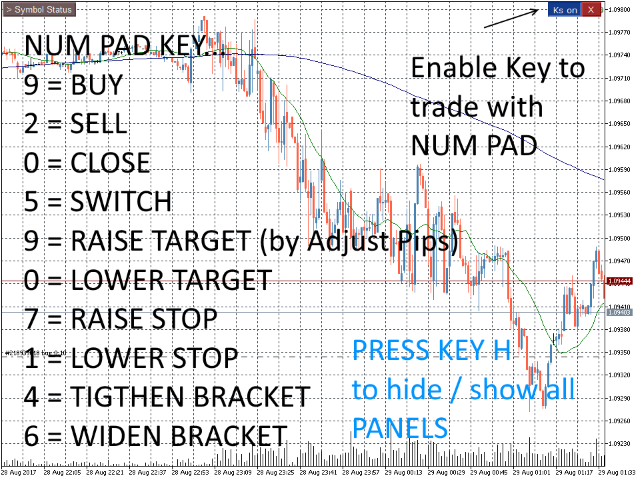 Trading with numeric keypad: Buy, Sell, Close, Switch, adjust stop and target. Next equity milestone in base currency. Your next equity target. The milestone percentage indicator in the information panel shows you how close you are. It is for motivation. Custom minimum margin level. Set a minimum margin level (= Margin / Equity x 100) maintained for your trading. For instance, if you do a Buy and the resulting margin level is below your minimum level, the orders is rejected, so not possible. This limits the risk taken. Simply follow this and your trading is much safer. Debug messages in expert journal. Shows internal state message. Only required to track problems. Default Off. Informational Panel (top horizontal). Shows most important values about position and account, like account profit, margin, position margin, account risk and more. Entry Panel (Button E). Use this panel to initiate orders and to control your position. Upper third: Place orders, Market, Limit, Stop Limit, double, half position, switch position and more. Mid third: Control position, close position, delete all pending orders for symbol, attach stop and/or target, change stop, target, bracket (raise, lower, tighten, widen), set stop to breakeven, when possible. Lower third: Quick select order parameters like volume, maximum price deviation in points, stop and target pips (0 don't attach stop and/or target) and pip step size for adjusting limit/stop orders, target and stop. PS. You can easily change the parameter key values in the lower third: just click on the key, then click on Setup to enable setup mode, then in the same row below setup field click in the edit field, type new value, press return, click Setup again to disable setup mode. PS. If you click on C key, the edit field to the right allows to set a custom value for this parameter. Exit Panel (Button X). In this panel set conditions to close position for symbol. Condition symbol profit <=. Close position when symbol profit below value. Value can be negative, positive. Condition symbol Profit >=. Close position when symbol profit above value. Value can be negative, positive. Condition time. Close position at time. Condition Moving Average. Close position, when actual close of bar <> (adjustable) than Moving Average over N bars of chart timeframe. Attention: Close means close of actual bar by default. Pending Orders Panel (Button P). This panel shows all pending orders for the symbol. You can change and delete them here. 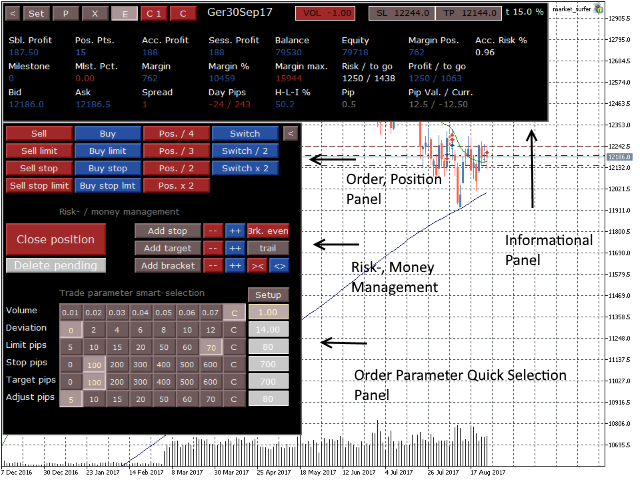 Show Stop and Target in informational panel top right in absolute prices or in pips. Close position by Moving Average is triggered when bar closed (default) / by current tick is below, above MA. Invert Orders: If active, Buy and Sell orders (only market orders) are inverted. This is useful, if your trading decision is mostly wrong AND you are NOT profitable. Numeric keypad is active for placing orders. The H key hides/shows all panels. Note: The demo is limited to one instance and to a maximum trade volume of 0.1 lots. - Filling mode for market orders configurable by global setup file "trade-commander/market_surfer_setup.txt" attribute "filling_mode". - Hiding/restoring panel by pressing H is now always active (not only when "Keys On").